Test and tagging is a generic name given to the process of visually inspecting and electrically testing in-service electrical equipment for personal safety. Colloquially, it is also referred to as; tagging, test tag, test and tag, electrical tagging, appliance testing, portable appliance test or lead tagging. 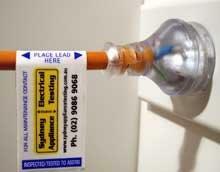 The aim of electrical test and tagging is to determine if the appliance is electrically safe for personal use. The appliance undergoes a visual inspection for defects such as damage or missing components and a number of electrical tests to measure earth continuity, insulation resistance and polarity. In Australia and New Zealand, this is done using the Standard; AS/NZS 3760:2010 “In-service inspection and testing of electrical equipment” as a reference document. Electrical safety and regular yearly inspections of your electrical tools, appliances, power leads, extension leads and all other workplace electrical equipment is essential. Here’s what the Regulations say…. Electrical equipment used in construction work must be regularly inspected and tested in accordance with the requirements of the Workcover Code of Practice (2007) – Electrical practices for construction work. Chapter 5 “Inspection and Testing” The OHS Regulation (clause 64) requires the employer to ensure the electrical installation and electrical articles are regularly inspected, tested and maintained by a competent person to ensure they are safe. All electrical plant including portable plug-in electrical equipment and flexible extension cords must be visually inspected regularly for wear and mechanical damage, and tested in accordance with AS/NZS 3760 for earth continuity and insulation resistance or leakage current. at regular 1 monthly intervals for all other construction work, except if an electrical equipment risk assessment report determines that inspection and testing shall be carried out by a licensed electrician at regular 3 monthly intervals. Tested plant, portable plug-in electrical equipment and flexible extension cords must be tagged and all test results recorded in accordance with the requirements of clause 5.6 (a) and (b).